Channel 4 has quietly launched a campaign to promote the second series of its TV drama Humans, issuing a product recall for faulty robots or "synths". 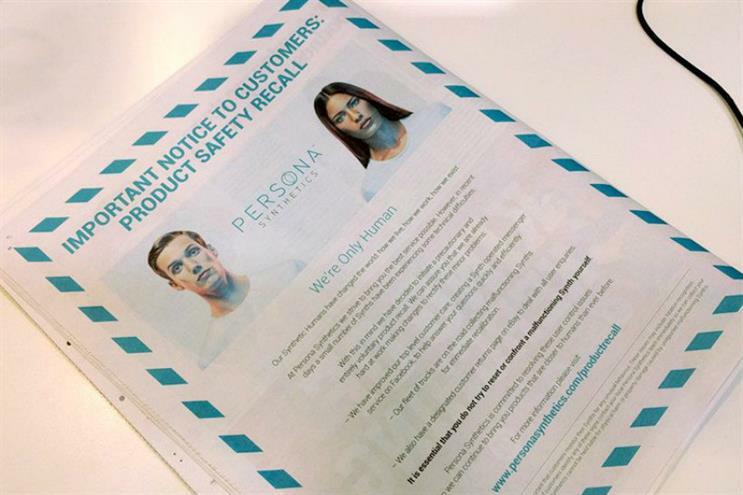 The broadcaster ran a print campaign across UK newspapers on Friday (23 September) in the guise of Persona Synthetics, the fictional company behind the synths. In the ad, Persona Synthetics warns readers that a number of faulty synths are on the loose, and that humans should on no account attempt to "reset or confront malfunctioning synths". The ad refers to the plot of the first series of Humans, in which a gang of synths rebel against their human masters. The print ad directs readers to a new section on the Persona Synthetics site, featuring an online video promoting the series. 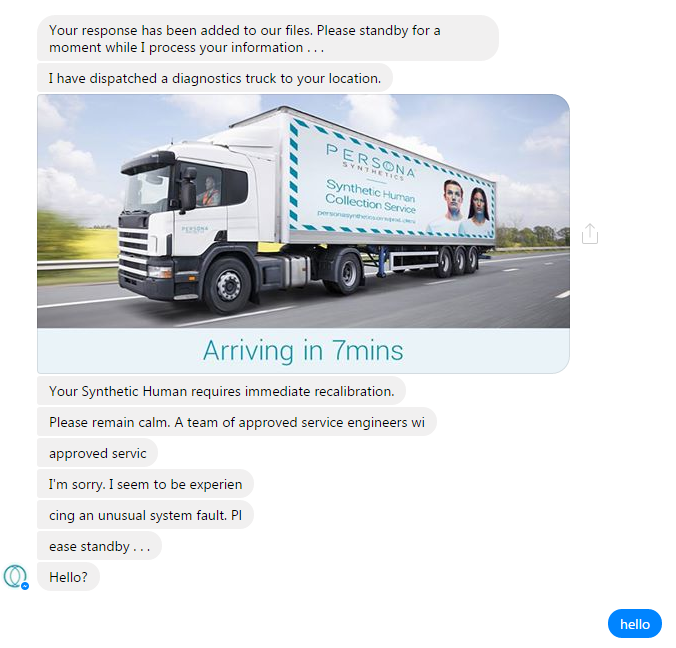 Channel 4 has also created a Facebook Messenger chatbot, which can answer viewers' questions, much like a livechat tool on a real brand website. The bot appears to be built on computer conversation service PullString. Launching a chat session with the synth-powered bot continues the charade. The synth conducts a Q&A with the user, which becomes increasingly unnerving. 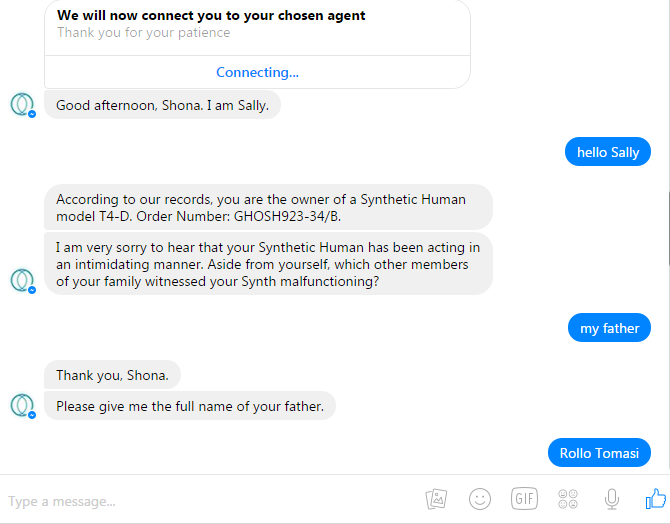 Campaign had a chat with Persona Synthetics' synth [see below], but we won't reveal too many spoilers. Channel 4 is publicly denying the stunt in tweets to anyone who spots the print ads and site, but it's likely the campaign was created by its in-house agency, 4Creative. Last year, the broadcaster quietly created a pop-up shop for Persona Synthetics in a stunt which helped attract six million viewers for the first episode.